In recent years, the young, educated, and affluent have surged back into cities, reversing decades of suburban flight and urban decline. and yet all is not well. 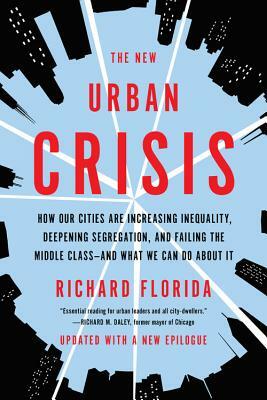 In The New Urban Crisis, Richard Florida, one of the first scholars to anticipate this back-to-the-city movement, demonstrates how the forces that drive urban growth also generate cities' vexing challenges, such as gentrification, segregation, and inequality. Meanwhile, many more cities still stagnate, and middle-class neighborhoods everywhere are disappearing. We must rebuild cities and suburbs by empowering them to address their challenges. The New Urban Crisis is a bracingly original work of research and analysis that offers a compelling diagnosis of our economic ills and a bold prescription for more inclusive cities capable of ensuring prosperity for all. Richard Florida is university professor and director of cities at the Martin Prosperity Institute at the University of Toronto, a distinguished visiting fellow at NYU's Schack Institute of Real Estate, and the cofounder and editor-at-large of the Atlantic's CityLab. "Florida draws subtle, thoughtful inferences from his research, and he writes in slick, approachable prose.... Throughout, the author remains an idealistic, perceptive observer of cities' transformations. A sobering account of inequality and spatial conflict rising against a cultural backdrop of urban change." "Urban planners should consider the case being made for the need to address a new urban crisis. A thought-provoking work for those interested in all stages of urban planning and placemaking." "Richard Florida demonstrates again that he is one of the most discerning (and provocative) observers of the great metropolitan migrations of the past 60 years." "This is the book we have been waiting for. Richard Florida is the greatest American urbanist of our time....This is an indispensable read for policy makers, students, educators, and all urban dwellers alike." "A sweeping narrative of the most significant human movement of our times: global urbanization. Richard Florida lays out with unassailable facts and clear vision the convergence of an urgent human development--the drive for more livable cities and the quest for a more sustainable planet. Clear, compelling, and full of vision." "Like the superstar cities it describes, this book is dense, complex and stimulating. Florida's well-researched and fluent exposé of inequality is a wake-up call to all the major actors engaged in planning, designing and managing cities in the 21st century."